Studio Pha applies wooden cladding wall to a contemporary house in Cernosice, Czech Republic. Luxuriant garden with leafy trees and decorative gravel surround the building that harmoniously combine with wooden deck with wooden open terrace with a tree between the wood beams and stone floor terrace, make spacious sight and free space for having an outdoor activity. 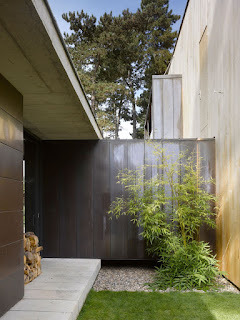 Glass and dark wooden wall also complete the building to have a natural look beside its minimalist and modern exterior design. Clean and spacious are the first impression for the interiors. 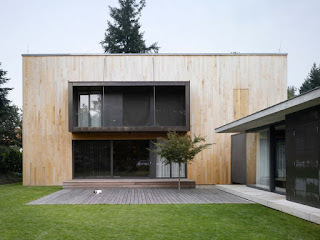 Exterior decoration use wooden cladding for houses usually, but this house applies those wooden elements inside too, for floorings and ceilings. Fireplace with black wall and wood shelf beside looks contrast with that woods that overlook to a set of white sectional sofas in a living room. But those woods look harmonious with plywood dining table in front of a wooden floor steel corridor with black round thread webbing hanging lamps. 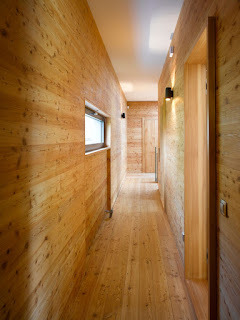 That corridor connects to the other side of the house with all woods decorations and applies as the floor, wall, and ceiling. A concrete wall with wooden statue stands in the middle of that space and cover the wooden stairs behind. That stairs connect to the higher corridor with the same all woods elements and glass wall hedge the corridor. This corridor is the main way to several rooms with wooden doors on that floor. The architect installs glass windows on several sides of that wooden corridor. Those windows will give natural lighting down the corridor beside to accentuate its natural accents from the crude woods. The bathroom has the same nuance as the corridor, but the difference is the bathroom use ceramics as the wall and flooring with a touch of varnished wood wall in front of the same wooden top of white sink. For applying internal wood cladding for houses, crude or varnished woods, both are look good, and it depends on your choice, whether choosing a rustic of classic look.